Continuing our theme of the fantastic Mattel Masters of the Universe Classics line, today we feature Faker! Released way back at the New York Comic Con before you were able to score it from mattycollector.com, Faker is another popular character from the He-Man cannon to find form at the hands of the 4Horsemen in 2009. Created by Skeletor to resemble He-Man and generate chaos and confusion, he ended up with blue skin revealing him for the hoax he was, and showing that Skeletor is in general a lousy magician! 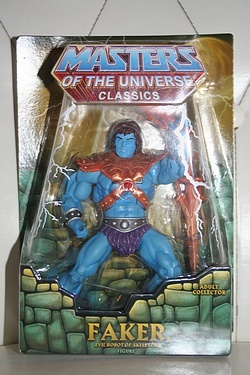 Click the image below for the full bio, and some more packaged pictures of this excellent member of the 2009 MOTUC line!